With little oil, fry shallot till fragrant and golden brown. Add ham fry for a while and add spinach and fry till spinach cooked, dish up and set aside. Measure whipping cream and milk together in measuring cup (you can omit whipping cream and use all 160ml milk) add eggs, lightly beaten and pinch of salt, mix well. 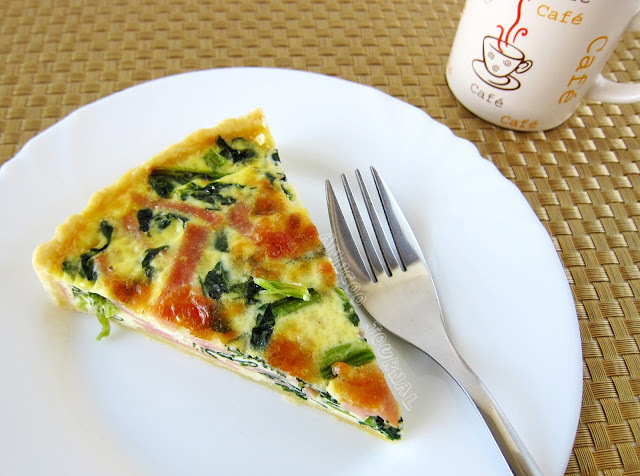 Spread ham spinach and cheddar cheese evenly over the bottom of the prepared tart pan, add a dash of pepper then gently pour egg mixture over it. Bake at preheated 180C for 40 mins and serve hot or warm. This is excellent when served with a cup of hot brewed coffee. Hi Ai Li, I’m sorry that I’m not sure how many I can make in the small pastry tart. Have to try and tested. simply gorgeous, you really have perfect baking skills! 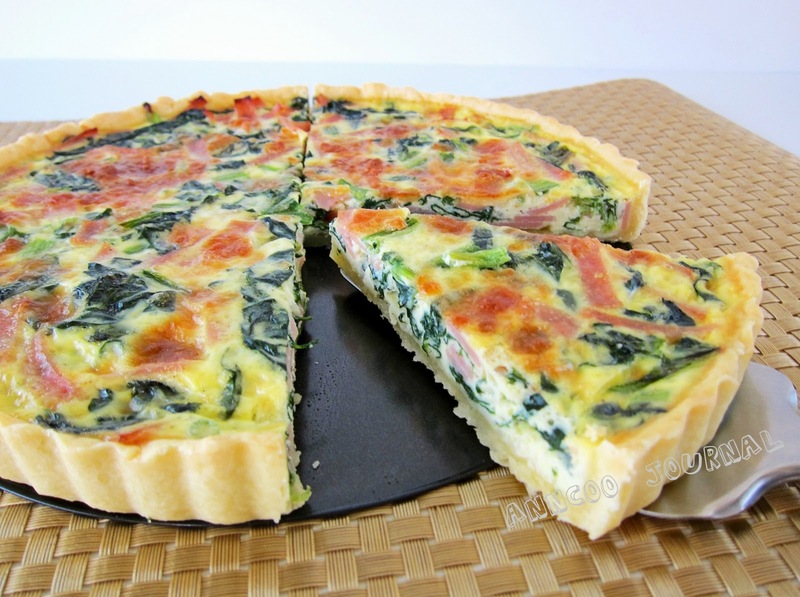 Cheese, spinach, ham, shallots…what a great savoury tart! I made this lovely quiche yesterday and it was very delicious! Of course I had a lot of recipes I had to catch up on but this quiche is calling my name. Sonia, I used po chor. With the eggs, milk and cheese you can also add onion and bacon. This look really yummy, I bet my kids will like this. But I a bit confuse what spinach should use, you use yin chor/ bayam or po chor? Bookmarked this lovely quiche for tomorrow breakfast! Thanks for sharing. I love quiche. They're quick and easy meals. I've been wanting to do quiches but never got down to doing it. Yours is tempting me to make one. Its very well done! Gonna bookmark this for reference. I love salmon will definitely try with salmon for sure. Very nicely baked quiche. Looks so yummy. Ann, nice one! 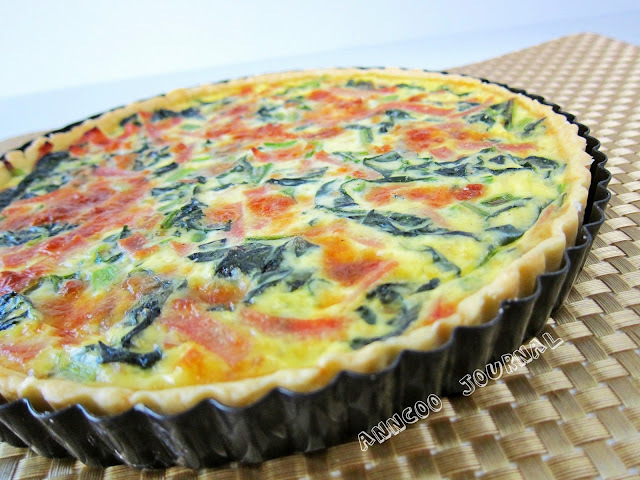 Haven't tried baking quiche before, wanna try after seeing yours, so tempting! Gorgeous looking tart, looks perfect and yummy. That last photo is so good. It says it all!! I love recipes like this that are perfect for using leftovers!! Yours looks beautiful!! Your quiche is looking delicious, Ann. Beautiful perfectly browned top as well. I'm a big fan of vegetarian quiches. This one with ham would make the hubby much more happy though. Reminded me of my salmon spinach quiche. :)I bet my kids would love the ham version too! This is one of the best ways to sneak veg into their diet, heehee! can i have a slice for lunch please? A French classic dish. This is one of the first dish that I ever made which is savory and baked. keep a slice for my tea please. thank you. I love how adaptable quiches are – this one is gorgeous! You're right Lindsey. Yesterday I also fried noodle with some leftovers. Look so pretty and delicious . Can inured puff pastry instead? Good Morning dear~ I'm coming for my breakfast.. hahaha…. Your quiche is beautiful! I like to make quiche for the same reason, it's so virsitile you can add anything to it. Fried rice is the same way, a good vessel to clean out the fridge.